With all the traveling lately, my wife and I haven't had much opportunity to explore our current residence of Taichung City. August provided us with two solid weekends home, the first double set in a long time. The first weekend we just spent recouping from the many hours of breathing recirculated airplane air and the countless nights away from our memory foam bed. However, the second weekend we agreed to do some exploring. I was able to finally get my Taiwanese Drivers License which opened up some possibilities, since public transportation in Taiwan is hit-or-miss. We had been wanting to go to Dakeng (大坑) for a while now, but finally had the means and motivation. Audrey is not the most avid hiker on planet earth, but I convinced her to go and spend time with me anyways. It's not that she doesn't like hiking, in Korea she does great, but add in the element of the Giant Wood Spider in Taiwan and she becomes a little more reluctant to go. For those of you who don't know about this beast, they are commonly the size of a human hand and have the spindly 8 legs and creepily-unique body shape nightmares are made from. Her fear of this creature came from another blog about Dakeng, in which the writer stated they are quite common in the mountains of Taiwan. However, I convinced her to go anyways, thinking to even myself the odds of encountering such an arachnid were minimal. The drive out of the city wasn't too bad. We live near SOGO department store in the heart of Taichung, and there was plenty of signage (in English) guiding us out of the city. However, the second you leave the city.. and I mean by a millimeter your English signs are gone. We spent about 1 hour driving up every possible jungle road until we found out how to get to the trail we were looking for - Dakeng Trail No. 4. I recommend getting clear directions from a local, or even bringing someone who has been here before along for the ride. Google Maps does not do a very good job of getting you to the right place, in fact it puts you about 4-5kms down the road of where you really want to be. Now that we were on the right road and were confident that we were heading the right direction, my wife yelled out something along the lines of, "Sweet Mother...No....NO! Seriously...That is not cool!" I was already on edge driving our 9-passenger VW Bus up a twisty, single-lane jungle road so I started to panic asking what was wrong. Her mouth was full of disbelief, so full in fact, she couldn't fit any words in there to tell me what was the matter... Finally clearing her throat and wiping off her sweaty palms she cried, "THAT IS THE BIGGEST SPIDER I'VE EVER SEEN!" Low and behold as I swung my head around to view what she was pointing at, it was the biggest spider I'd ever seen as well. 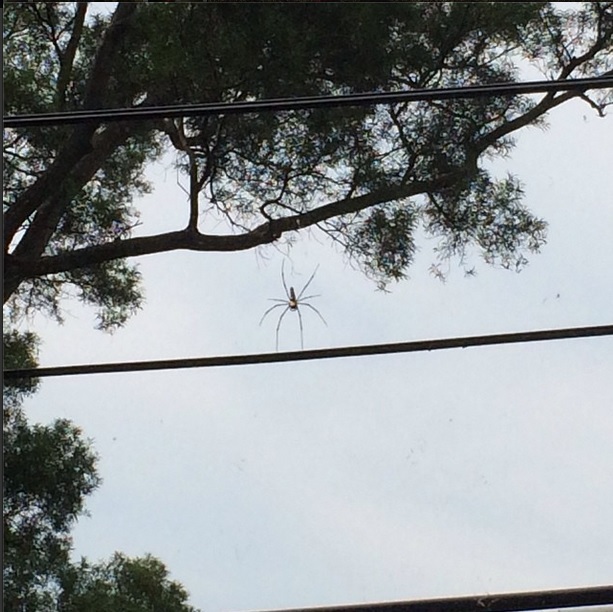 Hovering mid air on a web that would make Spiderman jealous was Hubert (Audrey named him) the Giant Wood Spider. No lie this guy's leg span could easily cover the face of a full grown man and the picture does not properly represent his size. All in all we had a great time! Audrey did an amazing job with her arachnophobia, and we were able to make it quite a ways up the ridge! In fact we made it past the entire stairs section to a flatter gravel trail. This is where the hike ended for us, because coping with spiders and ants by your feet is a little different than coping with Giant Wood Spiders by your head. One section of the trail there was no way to pass unless you came face to face with one of these monsters, no less then about 20 inches from your head. Granted we could have probably tucked and ran underneath, but for the sake of Audrey's health and knowing that we still had to make it down we decided to call it a day. Looking back we made some great memories and can laugh about the whole situation now! Being a former sufferer from arachnophobia myself I know how crippling it can be. When I was in college, I lived in my friends basement in Idaho. It had been about 2 years since the room was occupied, so a ton of our 8 legged friends moved in. No lie, we placed a Hobo Spider Trap (the sticky kind) in the room before dinner that first night, and by the time we where done, you could no longer see the trap. This 4" x 8" glue covered cardstock was complete covered. Needless to say I slept in the fetal position with poorly constructed defenses made from dirty clothing and shoe boxes. The concept in my mind was similar to how pioneers circled the wagons... Anyways, 1 year in that room cured me, not completely as they still freak me the freak out, but I'm much more poised and logical in make my decisions around them now. In conclusion, if you are looking for an adventure close to or nearby the Taichung area, Dakeng is a great place to spend the day. However, consider yourself warned on what or who you may encounter! And if you do make the trek, please make sure to say "Hello" to Hubert and his family. Tell him, "the Farley-Farr's are thinking about him."